At IC21, we believe in making making global connections, near and far. Although it may feel like we live in a remote region of the world (even more so when winter weather cuts off most road access! ), we actually are fortunate to share our community with a large number of “glocals” — global locals from a wide variety of international backgrounds. This past February, we introduced new programming to connect local high school students with foreign-born Jackson residents. 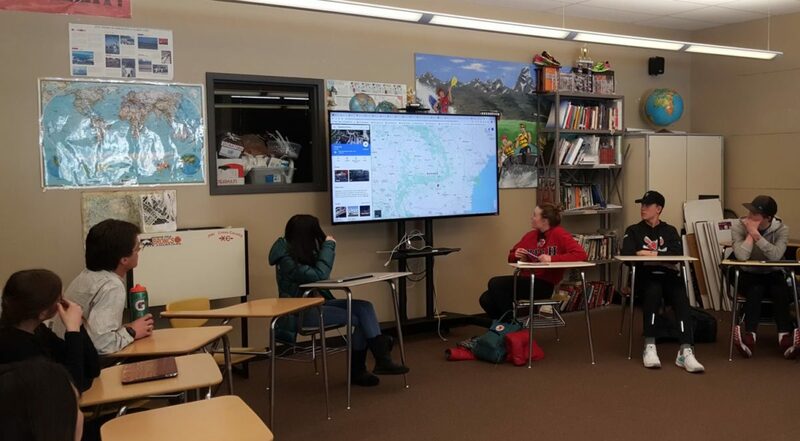 Students had the opportunity to learn about “small” (population: 20 million) cities in China with Xioalu (“Emma”) Tang, a Chongqing native. Alex Alexe, a local computer repair business owner originally from Romania, was also on hand to discuss Transylvanian castles and what life was like growing up in Eastern Europe after the breakup of the Soviet Union. To the students’ surprise, both Emma and Alex agreed that the high school experience was much more rigorous and curriculum-focused in their home countries than in America (for better or worse). We look forward to expanding the JH Glocals program in the coming months. Our robust immigrant community is a true asset in connecting Teton County to distant corners of the world! Xioalu is also working to make that world easier to understand — this summer she will be teaching Chinese lessons to students and adults at the Jackson Hole Language Academy. For more info, contact her at jhlanguageschool@gmail.com.